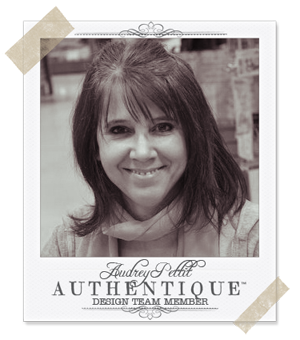 Hi everyone, Audrey here today, sharing a fun little baby home decor project featuring the adorable new Precious collection. Since my oldest is now in college, it's not often I get to play with sweet baby things, so I had a ton of fun with the new papers and embellishments in the Precious collection. Whether you are in need of baby boy items, baby girl, or gender neutral, Precious has you covered, combining a mix of prints and colors in one cohesive paper line. 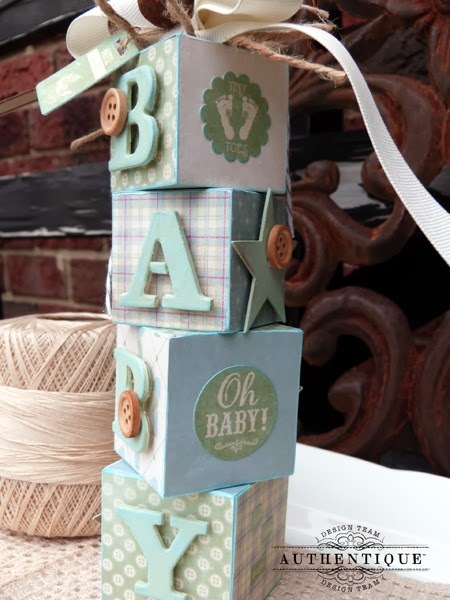 I decided to use a little boy palette of green and blue to create a stack of sweet wooden baby blocks, perfect for welcoming baby to his new home. 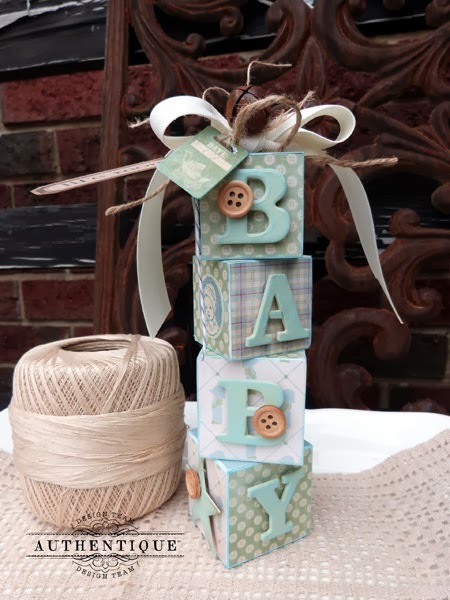 Wood blocks like these can be found in the unfinished wood section of your big box craft stores, or are easily cut at home from scraps if you have someone handy with the tools around. Once you have your blocks, simply cover each side with a variety of papers from the 6x6 Bundle. 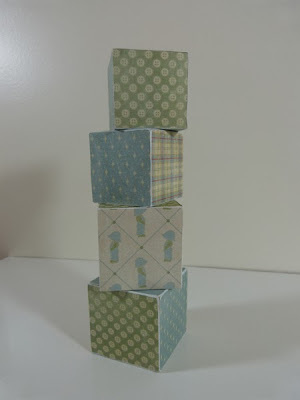 To do so, measure the sides of the blocks and cut squares of paper to fit. Adhere paper to the wood using glue stick or a thin coat of tacky glue. Sand the edges and then ink each edge using light blue ink. Stack the blocks, and adhere with tacky glue. Gather some chipboard letters to spell out the word baby. 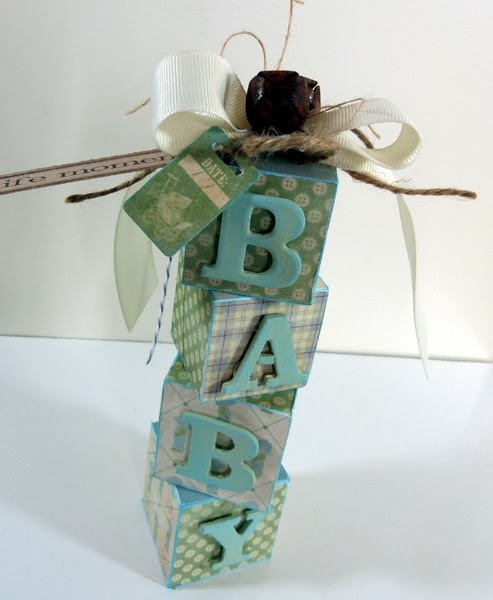 Paint the letters light green, and then edge each letter with the light blue ink used to edge the blocks. Affix the lettering to the blocks using dimensional glue dots. Tie a bow from 1" wide cream grosgrain ribbon and adhere to the top of the blocks. 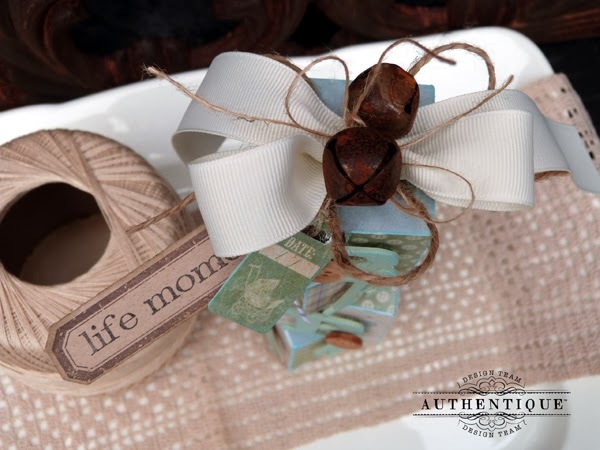 Tie a pair of rusty bells with natural hemp cord and baker's twine, and add them to the center of the bow. 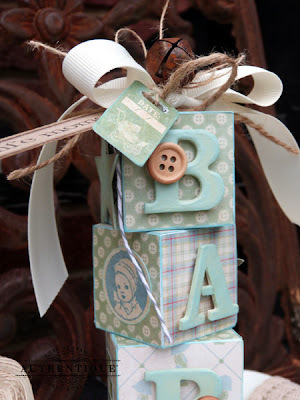 Die cut and stamp a label from kraft cardstock. Tie the label together with a tag from the Precious Elements sticker sheet using thick hemp cord, and then tie the two into the bow at top. 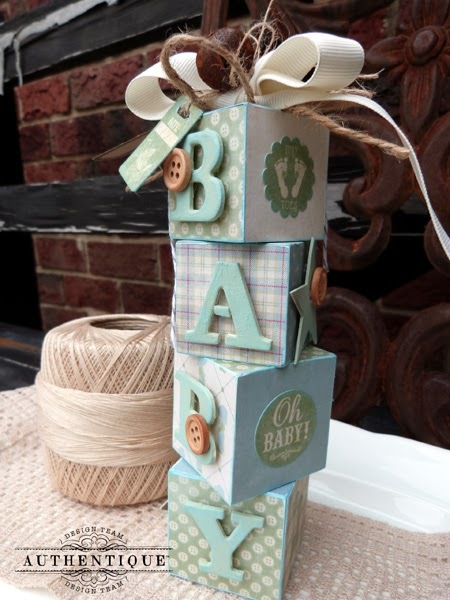 Apply baby stickers from the Elements sheet to various sides of the blocks. Die cut or hand cut 2" stars from thin chipboard. Paint them with the green paint and ink the edges with blue and brown inks. Adhere stars to the blocks using dimensional glue dots. Adhere a few wooden buttons randomly to the blocks. Very cool shower gift! Love it! Eek so stinkin' cute! Love this! A .. DOR ... A ... BLE !!!!! Love the blocks. I'll be attending a baby shower soon and this would make a great gift. thanks for the idea. Thanks for sharing this post with us...nice and use full article...Super Glue or Cyanoacrylate. Hello 👋! I love ❤ the blocks and I'm about to have a granddaughter. Do you make those blocks and sell them.